Capture the beauty of this lovely two way sliding door curio. With its tailored simplicity, this curio would work equally well in soft traditional or sleek modern interiors. 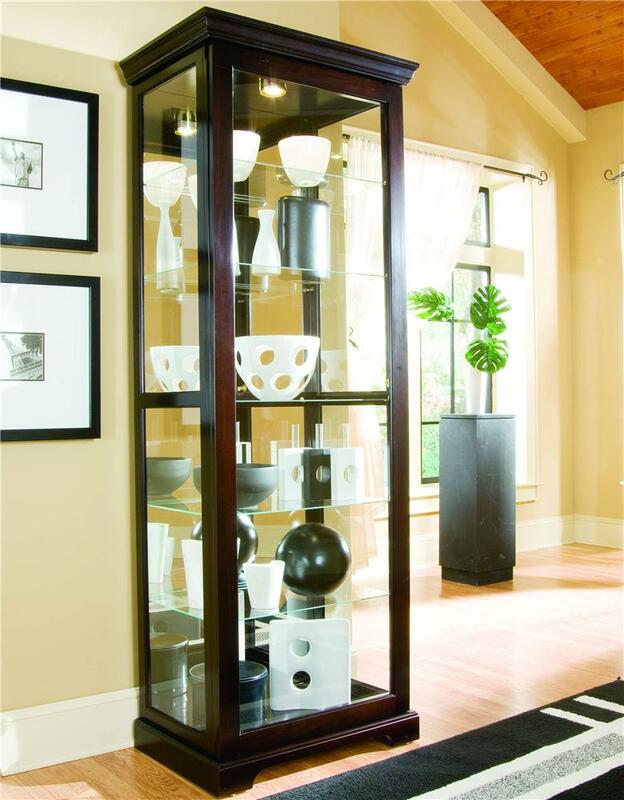 Features like adjustable glass shelves, adjustable levelers, glass shelf kit #2, a halogen light, locks and a mirror back all work together to create a great display space for collectibles and belongings. There is plenty of room to display and store these items with a two-way felt-lined sliding door. All created with clean lines, a plinth base, capital molding in a stunning Chocolate Cherry finish, your home is sure to stand out for the better. The Curios Chocolate Cherry II Two Way Sliding Door Curio by Pulaski Furniture at Miskelly Furniture in the Jackson, Pearl, Madison, Ridgeland, Flowood Mississippi area. Product availability may vary. Contact us for the most current availability on this product.